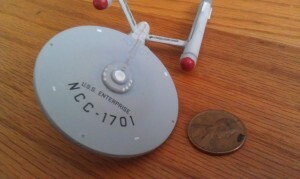 Finally finished my TOS era Enterprise. When last I mentioned her, I had completed painting and assembly with several significant mishaps, also known as learning experiences. The completed ship was a little misshapen but turned out better than I had expected. 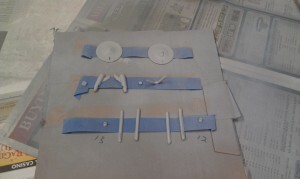 But it wasn’t done as I still had a sheet of decals to apply, something I was dreading doing. Turns out I was worried about the wrong things. 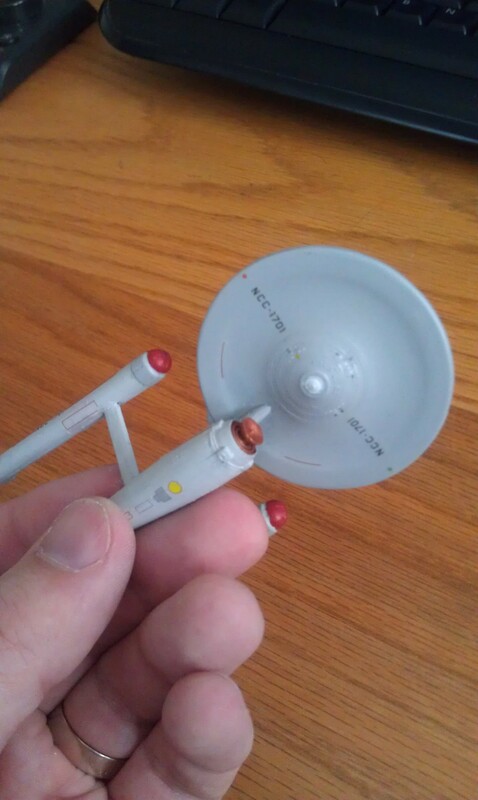 My childhood memories of model building include lots of instances of getting stickers applied crooked and then torn or bent as I tried to peel them off and reapply them. Modern models do it a little differently and it wasn’t clear until I started how they really worked. The instructions state you need to cut a decal from the sheet and then soak it in water for about 20 seconds. Then you slide it from the backing paper and apply it. For most people, that might sound pretty clear but for me it was confusing. Do I lay the whole thing on the model and then slid the paper out from under? How would I pull on the backing paper and still keep the decal from moving? The application process sounded pretty iffy. Thankfully the reality of applying the decals was much simpler. After trimming a decal from the sheet with a knife, I dropped cut piece in water and waited until I could slide the decal around on the sheet. Too long and it detaches and floats, which isn’t too bad but some decals are pretty delicate. Apply a decal is super easy, just put it next to where you want it to be and slide it off of the backing paper onto the spot. The best part is a decal won’t stick until it dries, so I was able to shift them around as much as needed to make sure everything was placed and aligned correctly. The one thing I hadn’t counted on was the extremely small size of some of the decals. 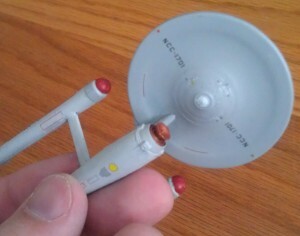 For instance there were small red and green dots for the top and bottom running lights of the saucer section. These were about the size of a pin head. Not having a set of tweezers or probes, I found that toothpicks I’d bought for applying glue worked great to manipulate even the tiniest decals. Plus the decals didn’t stick to the wood like they did to my fingers. One adjustment I made was for the windows on the bridge dome. The decals wouldn’t lay quite right and they were just a series of tiny white dots anyway, so I decided to paint them on instead. 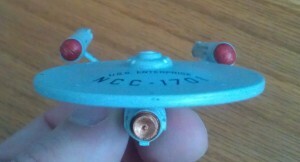 You can see in the front view that the nacelles are not aligned within Starfleet tolerances. Overall, I’m pretty happy with how she turned out. 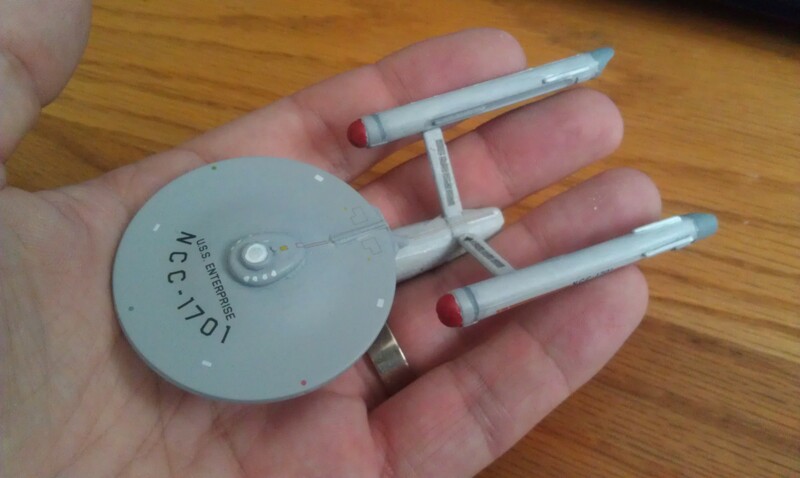 The size of the model made it a good cheap starter project, but it also required a lot of skill to handle all of the tiny parts which made if more of a challenge than I expected and thereby much more educational. I’ve really learned a lot from this first model (or first in almost thirty years), and I’ve already seen my Enterprise A and B attempts turn out better in the painting and assembly stages. 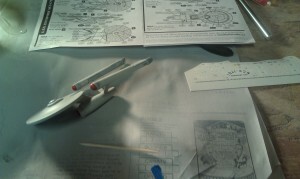 So as a test, I bought a second kit of the 1:2500 TOS, A, and B models and started on version two of the 1701. Thanks! 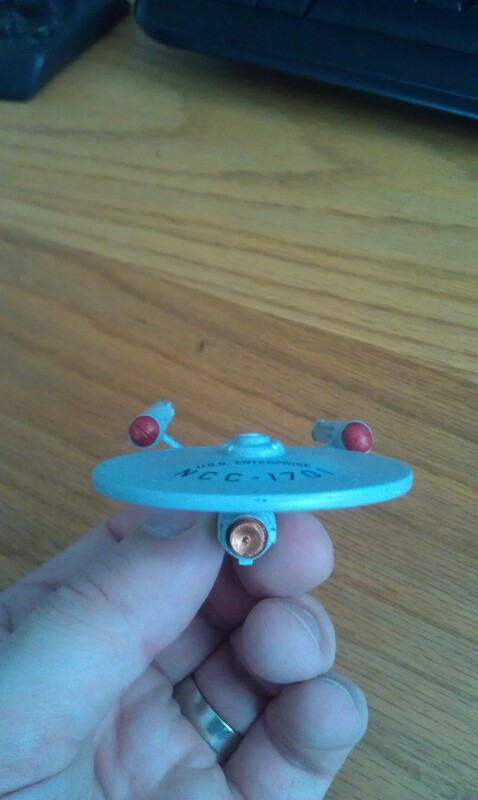 The nacelles are the most noticeable thing, but there’s some problems with the decals on the struts as well. Still, not bad for a first try.